The quiet seaside village of Rhoscolyn is set in a stunning location 5 miles to the south of Holyhead on Holy Island, Anglesey, in between its two busier and larger neighbours Trearddur Bay and Rhosneigr. The village was frormerly known as Llanwenfaen (the church of St. Gwenfaen). The name Rhoscolyn is said to derive from "The Moor" (Rhos) of the Column (colyn), referring to a pillar erected by the Romans to mark the edge of their territory. Rhoscolyn is bordered to the south by a small enclosed bay called Borthwen, a lifeboat station once stood there but has been replaced by a navigational beacon on Ynysoedd Gwylanod (Gulls' Island). Rhoscolyn's award winning beach is located between Rhoscolyn Head and Silver Bay, a sweeping cove of sand with enticing rockpools and backed by dunes, it is sheltered by rocky headlands and is popular for swimming, scuba diving, surfing, sea canoeing, sailing, and fishing. The beach is accessed by the Anglesey Coastal Path, which passes the village, or via a narrow winding lane. The nearby village pub, the White Eagle, serves excellent meals and caters for walkers. 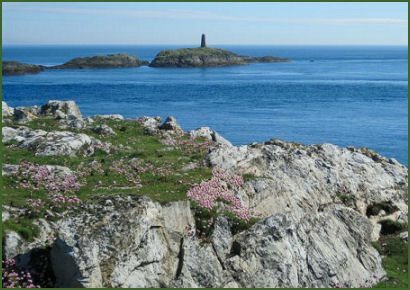 The Beacon tower stands on a small rocky island off the coast at Rhoscolyn,. The island is one of a group that are known as Ynysoedd Gwylanod (Seagull's Islands). The beacon has served as a navigational aid for well over a century. Originally the beacon would have been painted black and white. Seals can often be sighted on the islands. The coastline of the area is of rugged cliffs stretching towards Cymyran Strait in the one direction and towards Trearddur Bay in the other. 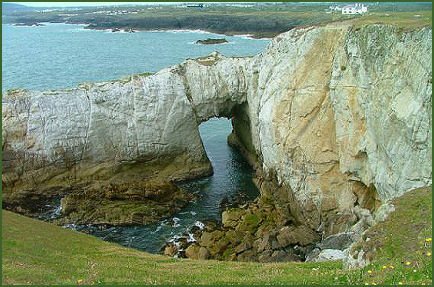 Bwa Gwyn (White Arch), is an impressive gleaming white rock arch, visible from Rhoscolyn Headland. The walk along the coast from Treaddur Bay, past the Rhoscolyn beacon and the look out tower is stunning. The spectacular views along this walk and those from Rhoscolyn stretch across the sea to the mountains of Snowdonia and the Lleyn peninsula. Rhoscolyn Burial Chamber is situated In a field next to the footpath which runs along the edge of Borthwen Beach, looking out over the sea and is easily accessible from the beach. Doubt has been cast on the monuments authenticity and it has been said to be a modern folly rather than a genuine Neolithic burial chamber. Spectacularly sited St Gwenfaen's Church, situated on the edge of the village, was founded in 630 AD and is dedicated to Gwenfaen, daughter of Pawl Hen of Manaw in the Isle of Man, who made her cloister at Rhoscolyn. Pawl Hen is known to have been a bishop in Wales in the 5th and 6th centuries, having founded a monastery at Whitfield in Carmarthenshire in around 480. He lived to a very old age, hence his nickname Hen (old) . Legend relates that St. Gwenfaen was chased away from her cell by druids, and that she escaped by climbing the rock stack off Rhoscolyn Head. The tide came in and she was carried away by angels. Saints Bay derives its name from this legendary incident. A fifteenth century building which once occupied the site was destroyed by fire, the present building dates the 1870s. The architect was Sir George Gilbert Scott who also restored Bangor Cathedral and St Cybi's church in Holyhead. A mediaeval doorway has been preserved from the former church and a 15th century font and chalice. The stained glass windows above the altar are particularly attractive with a depiction Rhoscolyn bay and the Beacon Rocks. In the churchyard stands a monument to five crew members of the local lifeboat that died during a storm in December 1920, attempting to rescue the crew of the stricken vessel Timbo. 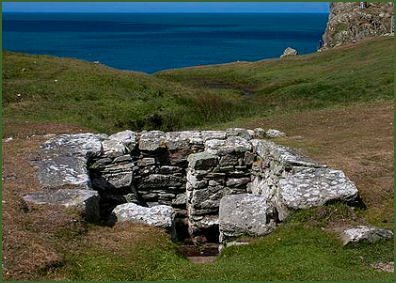 St Gwenfaen's Well or Ffynnon Wenfaen in Rhoscolyn is one of the best preserved well chambers on the Isle of Anglesey. The well, which is reputed to have healing powers, is situated near to the edge of a cliff on the coastal path on the western slope of Rhoscolyn Headland. The date the stonework was constructed is not known, but it probably dates back to medieval period, most of the existing stonework lies below ground level. The structure consists of a sunken antechamber with a stone paved base with four seats at the corners. Beyond is an enclosed pool with seats at either side, and in front of that an open pool approached by three steps on each side. The water is held behind a vertical slab and spills over a notch into a narrow stone-lined channel and from there over the edge of the cliff. The well is of a drystone construction, built using large light grey stones. The well is traditionally said to cure mental disorders, offerings of two white pebbles were thrown into the water by visitors to the well. St Gwenfaen's Day (4th November) is celebrated every year in St. Gwenfaen's church, followed by a walk across the headland to the well for a blessing ceremony.